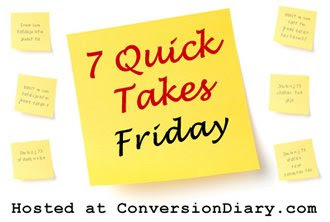 Yes, once again it's time to bring some testosterone into the Seven Quick Takes tradition as sponsored by Jen at Conversion Diary. 1. Our daughters refer to hard liquor as "yucky water" and have no interest in wine or beer, but apparently they find the bottles fascinating. Without my knowledge, they'd been pulling bottles out of the recycle bin for some time and using them to stock the "kitchen" in their playhouse out back. MrsDarwin discovered this today when they pulled out two wine bottles and one from Bombay Sapphire while playing with the boy from down the street. What he made of this, I cannot say, but the bottles were neatly lined up on the grill (along with a discarded maple syrup bottle and a plastic tea kettle) when I got home. 2. It think it'd been a year or so since I'd had a chance to take a full hour of Eucharistic adoration, but last week I took MrsD's 2-3 AM slot (leaving her to get some sleep) at the First Friday adoration down at our parish. Waking up at 2 AM is, surprisingly, a lot easier than doing so at my usual 6:30, and it was an incredibly peaceful and fulfilling time - so much so I found myself over-staying by half an hour. Among other things, it occurred to me that (with laziness and early morning meetings having taken me off going to 7AM daily mass about a year ago) I seldom enter a church these days without four kids in tow -- which needless to say is not likely to help one encounter Christ with any calm. 3. I've been reading and very much enjoying The Battle: A New History of Waterloo by Alessandro Barbero. Reading a 300 page history book which covers a period of only 36 hours gives you a chance to gather a great deal of detail, and Barbero provides it in the form of many details, fascinating and sometimes harrowing. Take, for instance, the experiences of British cavalry officer Sir Frederick Ponsonby, who appears several times during the course of the book. In combat with Jacquinot's lancers, he was wounded in both arms and lost control of his horse, which carried him into the midst of the enemy, one of whom finally felled him with a saber cut to the head. When he regained consciousness, he was lying in the mud, and he struggled to raise himself; a passing lancer saw him move and gave him a thrust through the back, crying out, "Tu n'es pas mort, conquin?" The steel point entered under his shoulder blade and punctured a lung. The colonel, who was only thirty-two years old, felt his mouth fill with blood and lost consciousness, convinced that the end had come. Sir Frederick Ponsonby was an involuntary witness to this type of combat. When he regained consciousness, he found himself wounded and immobilized in a sector of the battlefield patrolled by enemy skirmishers. One of these threatened to kill him and demanded his money; Ponsonby let himself be searched, the man found what he was looking for, and he went away. A second skirmisher with the same intentions arrived on the scene but left disappointed after an even more meticulous search of the colonel's person. Finally, an officer passed his way at the head of a group of soldiers, gave Ponsonby a swallow of brandy, ordered one of his men to put a knapsack under the colonel's head, and then departed, apologizing for leaving him there: "We must follow the retreating English." Still later, another tirailleur came by and decided to use the immobile Ponsonby as a screen. He stayed for a long time, reloading and firing over the colonel's body again and again, "and conversing with great gaiety all the while." At last he went away, but not before assuring Ponsonby that he should not worry: "You'll be happy to hear that we're going to withdraw. Bon soir, mon ami." When he finally came to his senses during the night, a dying British dragoon, having dragged himself to where Ponsonby lay, was crushing him with his weight and clutching his legs. Seized by convulsions, the dying man held on tight, gasping for breath, and all the while air hissed atrociously through the open wound in his side. The night was clear, and Prussian soldiers, bent on looting, were circulating all around; more than on approached and took a look at Sir Frederick, but they left him alone. finally, a British straggler passed that way and stopped to keep Ponsonby company, freeing him of the dying man and keeping scavengers at bay with a sword he had picked up off the ground, until morning came and the colonel could be loaded on a cart and carried away to the surgeons. 6. I have few regrets about having been homeschooled in high school. At the time, I got cranky about the lack of social life (read: cute girls) but since high school is generally not the most wonderful time of life anyway (and I went on to have a very good time in college) I don't see that as a lack from this vantage point. However, one thing that I do regret about not having gone to the boys high school that I almost ended up at is that I wasn't forced to go through P.E. I wasn't totally out of shape during high school because I fenced (the appeal of a sport involving swords overcame my native inertia) but I wish that I'd had to do all the stuff that didn't interest me in that regard as well. It's easier to develop physical abilities when your body is younger, and you have more time on your hands. Somehow it stuck in my mind that one of the P.E. requirements at Crespi Boys Prep was being able to bench press your own weight. Fifteen years later, I'm gradually working my way there -- currently maxing out at three reps of 135lbs. I'm hoping I can work up another 45lbs by the end of the year, but I wish that I'd got there a long time ago. 7. As a parent, one has flashes of realization as to how one's own parents felt about things. The other day I had one of these when my oldest daughter lay sprawling half on, half off the couch and complained to me, "Daddy, I'm boooooooored." Daddy paused a moment to collect the full force of his indignation and then explained, "Do you know why it is that Daddy is not sympathetic when you say you are bored? Because there are lots and lots of things that Daddy would like to do if he didn't spend most of his time working or cleaning or dealing with children who poop their diapers and throw toys on the floor or sit around saying they're bored. Now go play or read a book or something or I'll give you something do to!" Having gone to a public highschool I can assure you that you weren't missing much. PE consisted mainly of running half laps then walking the rest of the way, plus an occasional game of dodge ball. Anyone with real athletic ability or interest did a sport (perhaps fencing) and was just exempt. Plus, it's impossible to look cool in gym shorts (if you're a dude, a woman of ability can pull almost anything off). I remember the first, and last, time Offspring #2 announced in that whiny, whiny voice, "I'm bored!" Offspring #1, with seven years more life experience, ran over and hissed in her ear, "Don't EVER say that to Mommy! She'll make you clean EVERYTHING!" I had no idea Ponsonby actually survived the battle. I've read a few books on Waterloo and I have a movie as well, which makes it look like Ponsonby bought it when his horse stuck in the mud. They even foreshadow this bit when he tells the story of his father's death. D says that the darn thing about the Chris Rock segment is that, minus the gutter language and a bit of comic hyperbole (i.e. "Drive with a white friend") it's pretty much the advice his mom gave him as a teenager. PE? What Blackadder said. Though, I'd add observations about how most male PE teachers tend to be egotistical petty tyrants and the female ones are, umm, shall we say not necessarily prime examples of femininity. But dodgeball sure was fun! I had to take 2 one-semester PE classes at my public high school. The first semester of my freshman year I was randomly assigned to a dance class. As in all but three other members of the class were on the pep-squad (like cheerleading but less gymnastics). The three other cool girls and I sat around and listened to indie rock and snuck out to the cafeteria to buy snacks. When it was our turn to show our (clueless) teacher our dance, we got up and randomly moved about to whatever song was next on the tape. We called it "interpretive dance" and she ate it up. Needless to say, not much exercise happened. My second gym class was badminton/archery/golf. Sadly, the badminton and archery, which were what I really wanted to do, were maybe four weeks each. Golf was replaced by tennis, which I hated at the time but now I can at least serve a ball over the net. So I concur, being homeschooled was not necessarily a loss in the PE dept. I am laughing so hard about #1, by the way. Sir William Ponsonby died when he led his cavalry unit too far into French territory and was eventually overwhelmed, but Sir Frederick Ponsonby (whose unit also went too far into French lines) is the one described above. Either way, rough day to be a Ponsonby. Kentucky used to only require one semester of PE in high school back in my day,and that was all any school did, public or Catholic. The Catholic boys school I took classes at did have a weight room that was open after school to all students, though. So, like others have noted, you probably didn't really miss much. My all girls Catholic school was where I learned to love lifting weights. Of course, they didn't make me bench press my own weight. I have to ask: are you talking about Crespi in Encino? My twin brother went there. Well, I think you did more than a fair job of that with #5! And you are so right about understanding what your parents were thinking. Now I tell myself my kids will get what I'm trying to say in twenty years. I enjoyed your Quick Takes. Thanks for giving us some male flavor. I imagine what you would have given her to do would have been much more boring! And indeed, Don, the top one shown is the Brown Bess -- I let her in despite her lack of rifling. Someone please do this favor: Go to 'Orphan Openings: High School Vampire...' and click on 'comments' (at this point it's 1 comment). Please read my comment. It asks a favor and asks a question. Nevermind. After posting my 'someone please do this favor...' post, I remembered about Snopes.com and I went and looked up my question. I came back here to say 'nevermind' and Mrs Darwin had already answered my question. Pretty responsive! LOL ... and pray tell, what is the response to the offer of giving them something to do? I've heard myself repeat that phrase almost word for word a thousand times and it gets me or their complaints nowhere. I still don't have a fool-proof response and doubt I ever will.